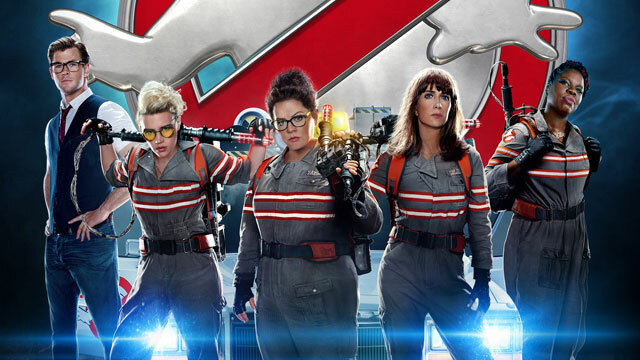 The all-female Ghostbusters remake has been making waves for months prior to its release because, apparently, women can’t bust ghosts, at least if you listen to the hysterical and misogynistic internet. Where you fall on the side of that argument will likely color what you think of the movie. Also, where you fall in terms of the “untouchableness” of a movie you enjoyed or loved from your past will also probably affect your enjoyment. I take the view that the late, great Terry Pratchett always said about any adaptations of his work – the original will always be there. The hubs, on the other hand, does not. We both went into Ghostbusters with relatively low expectations. Mine was to be entertained. His was to laugh all the way through. I laughed and was entertained. He laughed a bit but not as much as he’d wanted to, and he wasn’t entertained all that much. It’s pretty clear by now that this movie is breaking down, in a general sense, via gender lines – women are, for the most part, liking it a whole lot more than men are. And I think some of that is because half of the jokes the men don’t get, because, to them, that’s nothing funny, that’s just how life works. Whereas for women, we’re laughing because we’ve been through “that” before, possibly right before we got to the movie theater. 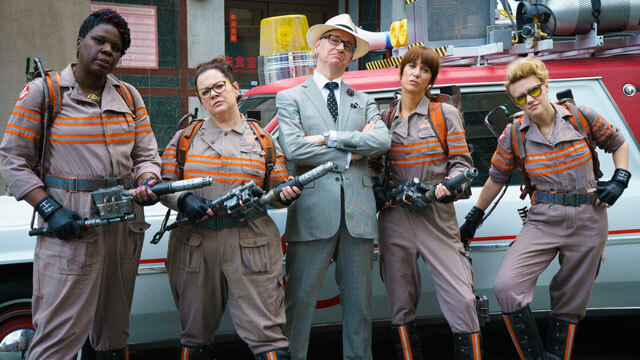 Director Paul Feig poses with the Ghostbusters in front of the Ecto-1. Patty Tolan (Leslie Jones), Abby Yates (Melissa McCarthy), Erin Gilbert (Kristen Wiig) and Jillian Holtzmann (Kate McKinnon) on the set of Columbia Pictures’ GHOSTBUSTERS. 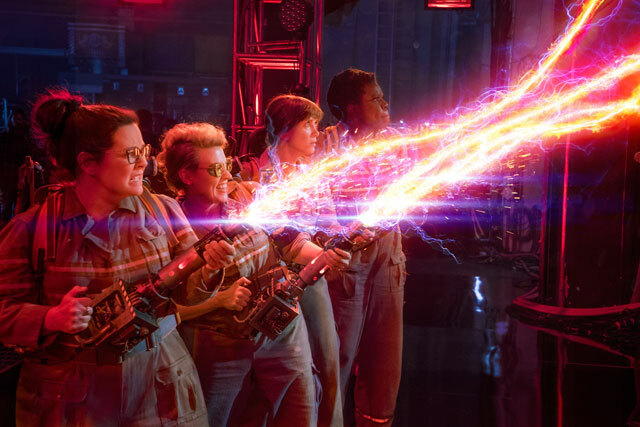 Ghostbusters – without being strident, ranting, obnoxious, or preachy – is the most feminist film I’ve seen in a long time. And I loved it. I’ve come to realize that Melissa McCarthy and Paul Feig are the most feminist folks working in movies today, making enjoyable movies that still share that it’s not the same experience for women as it is for men. The movie takes the view that the other Ghostbuster movies have never happened before. Or, for those who just can’t handle that idea, it’s in an alternate universe where the Bill Murray versions never happened. Erin Gilbert (Kristen Wiig) is working on getting tenured at Columbia. Due to something from her past surfacing, she’s forced to go reconnect with her former best friend, Abby Yates (Melissa McCarthy). Erin and Abby used to be into the paranormal, but Erin stopped because she wanted to fit in as a “real adult”. Abby, on the other hand, has found a new partner in crime, in Jillian Holztmann (Kate McKinnon – doing the “crazy genius” role to the hilt and owning it). Circumstances, and a real ghostly experience, mean that Erin is back in the game and the three start a paranormal business, focused on catching and trapping ghosts. With some success and a lot of pushback (and some hilarious lines referencing all that internet brouhaha, too). Meanwhile, someone is opening up portals to the paranormal, which is why Patty Tolan (Leslie Jones) ends up joining the team – she’s seen a ghost and goes to the only people who might do something about it. Together these Ghostbusters, helped but mostly hindered by their beefcake, dimwitted receptionist Kevin (Chris Hemsworth – hi-freaking-larious), are out to save New York from this paranormal threat led by Rowan North (Neil Casey). The biggest thing that disappointed the hubs was that this was really a remake, not Ghostbusters: The Next Generation. The next biggest thing that disappointed him was that this movie is an action comedy, not just a comedy. I didn’t care, in part because I love action comedies and in other part because I was entertained and into the movie the entire time. I feel that the remake is a lovely homage to the first movie while still being all its own thing and I found it funny the whole way through. The cameos from the original cast are excellent and hilarious and totally not what you’re expecting. And most of the original cast is back for those cameos, other than Rick Moranis (who, in an interview with The Hollywood Reporter, is both extremely picky and didn’t want to work one day on something he’d done 30 years prior) and William Atherton (who’d played the villain/nemesis, Walter Peck, in the original, but who doesn’t have an explanation for his absence on the ‘net), and every cameo works. There’s a lovely tribute to the late Harold Ramis, too, both in the movie and during the credits roll. Regarding the credits, plan to stay through all of them. Not only is there a great little teaser scene at the end, but there is a hilarious dance number that runs through most of the credits that you don’t want to miss. I was entertained and into the movie the entire time. I feel that the remake is a lovely homage to the first movie while still being all its own thing and I found it funny the whole way through. The cameos from the original cast are excellent and hilarious and totally not what you’re expecting. I had not given this a high mark to see, till read Gini’s review, now i think i will take it in for tomorrow, maybe EVEN FULL PRICE. 😀 Hope you like it, Kenton! Knowing you, I honestly think that you will. Tell us here what you thought — we love to keep the conversation going! Maybe I can get James to take me now.